Savvy Sheep: What Has God Done for You, Lately? My latest post series was about what we ought to do for God. So often, rather than think about what I should be doing for God, I'm thinking of things I want or need Him to do for me. When I get into this pattern of thinking, it's not long before I'm just giving God a grocery list when I talk to Him. I know that the Bible tells us over and over again that God loves to shower the people He loves with good things. We are told to confidently approach the throne of God and give Him our requests. But honestly, we shouldn't think of God merely as someone who gives us stuff. He's so much more than that. I caught myself starting into a grocery list again when I was saying my prayers last night, but that attitude just didn't seem appropriate. So what has God done for me in the past week, month, year, decade? week: Everything from basic things, like supplying me with food, running water, and electricity, to major things, like reminding me to hold myself to His perfect standards, rather than the shifting morality of the world. month: Helping me cope with life's stresses and lifting me up so I can laugh at life and enjoy the sunshine and the beauty of God's Creation. year: Allowing my writing to find favor with a publisher, teaching me how to love the people around me with His kind of love, granting me more sleep. decade: Looking back, I can see His involvement in every situation, bright or dark, guiding me through and teaching me maturity and discernment. In all this time, He's led me through schoolwork, career choices, loss, relationships, and spiritual breakthroughs. Really, it's been a remarkable journey. I love to whine, how about you? I've just decided that today, rather than whine to God about everything that isn't going the way I intended, I ought to think about everything that is going well, thanks to Him. God already knows about my problems (He also knows how much I like to complain! ), but I think He deserves to hear how grateful I am to have Him as my closest friend and redeemer. Where would I be without Him? I know there are several people out there who regularly read my blog, so today I thought I might poll the readership. Can you think of something good that God has done in your life today? Would you be willing to share it with us? I'm excited to read your comments! By the way, since the title of my photo isn't showing up, I'll tell you that it's a picture of a cicada I caught this summer. 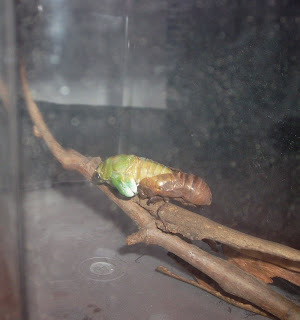 I got to watch it transform from a dirty brown juvenile into an irridescent green adult. That always amazes me and makes me thankful for a God who's into details, and, of course, changing people. What an awesome blog! We go way back with your mom and Dad to Chi Alpha days at OSU. Your mom and dad must be so proud of all God is doing, and will do through your writing. We are praying that God opens incredible doors of opportunity for you! Thanks! I'm hoping much will come of this small thing, as well.